Israelis reacted with a measure of resignation and humor to the news that Lebanon one-upped them for the world record for the largest plate of hummus. 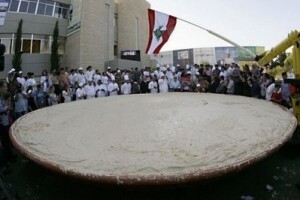 In the latest installment of the hummus war between the countries, a team of Lebanese chefs prepared a serving of hummus that weighed in at 10452 kilograms (23046 pounds) , setting a Guinness World Record . That broke the mark set in January by a restaurant in the Israeli Arab town of Abu Gosh, outdoing an older Lebanese record. The Lebanese plate had a special significance as far as Israel is concerned. The area of Lebanon is 10452 square km. The Lebanese in other words are telling the Israeli’s : Get out of the occupied Lebanese territories : Shebaa farms, Kfar Shouba and Northen Ghajar. “It’s preferable that the war will be over hummus than on the battlefield, no?” jokes Maor Barazi, as he wiped up a plate of the chickpea dip with pita bread at Meshawshe, a Tel Aviv hummus restaurant. While Israelis claim hummus and falafel as national dishes, they also acknowledge that the best practitioners of the craft can be found in Arab cities and neighborhoods. According to a recent reader survey sponsored by Haaretz, an Israeli newspaper, the top two most popular hummus restaurants in Israel were located in Jaffa and Acre. The two agreed that they would have liked to sample the record-breaking dish, asserting that ultimately taste, not size, is what matters to them. Arabs complain that Israel has tried to steal their national cuisine. Several years ago the Lebanese trade industry reportedly mulled a hummus lawsuit against Israel for claiming ownership.